We recently reviewed the Meizu MX4 and concluded it has stellar battery performance so now it’s time to shed some more light on it. The Meizu MX4 was able to squeeze 89 hours of endurance from its 3,100mAh battery – that’s the time you can go without a charge if you do an hour of calling, browsing and watching video on your phone. It did so by getting very impressive talk time and browsing results and a commendable video playback result. To wrap the 89 hour off stand-by was very impressive too. The Meizu MX4 came from an under-performing family of phones – all of its predecessors ranked in the below-40h part of our battery table so it’s great to see the MX4 rip up the norm. 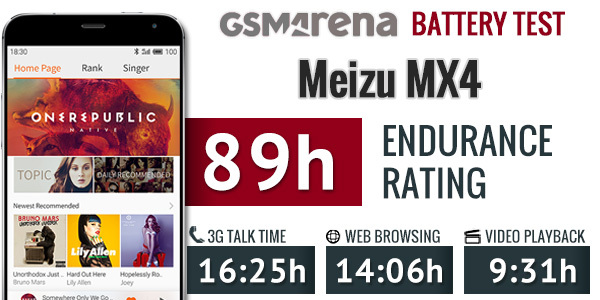 In our call test the Meizu MX4 went for a solid 16 and a half hours to beat a lot of the phones we’ve tested. It was inferior to the 18:15 hours of the Xiaomi Mi4 but beat the Xiaomi Mi3 by close to 3 hours. Both the Oppo Find 7 and Find 7a were out of reach and the same goes for the likes of the Samsung Galaxy S5, LG G3, HTC One (M8) and Sony Xperia Z3 but still a good score nonetheless. Web browsing proved another strong suit for the Meizu MX4 with a little over 14 hours of constant reloading of webpages. In this regard the Meizu MX4 was able to score the third overall spot beating the phablet Huawei Ascend Mate7 by 13 minutes. For comparison’s sake the Xiaomi Mi4 posted just 9 and a half hours, the Mi3 just 8 hours, the Find 7 a mere 5 hours and the Find 7a just 7 hours. Video playback didn’t go above 10 hours but was close enough – it took 9:31 hours before the charger was needed. That’s a hair better than the Xiaomi Mi3 and much better than the Xiaomi Mi4. It was also better than both Oppo Find 7′s (the 7a coming within a couple minutes of the MX4). The 9 and a half hours mean you’ll get to enjoy movies for long strides of time on the Meizu MX4. In our review we also liked its video performance – it managed to play just about everything we had up to 4K. Adding up all three scores to the stand-by of 520 hours the Meizu MX4 we get to the stellar 89 hours of estimated battery endurance. That score puts the Meizu MX4 in the top 10 of our battery test table and marks Meizu’s first good result ever.